Designer diamond Engagement Rings in Yellow gold, White Gold, and Pink Gold. HL Began in 1976 with a vision to manufacture fine jewelry of the highest standards. Their portfolio includes bridal mountings, gentleman's rings, fashion styles, remounts and custom or special order designs & mountings. Diamond Engagement Rings and Bridal Sets with a variety of settings. Vintage. Modern Cathedral. Halo. Solitaire. Three Stone. Bypass. Straight Line. Color Accent. Rings are also available in Rose Gold and Two Toned Gold. The Aspire Bridal Collection offers a variety of engagement rings with and without the center stone. the collections offers Bridal Sets, Men's diamond and plain Wedding Bands, and Ladies Diamond Wedding Bands. Gold, Silver, Mixed Metals? 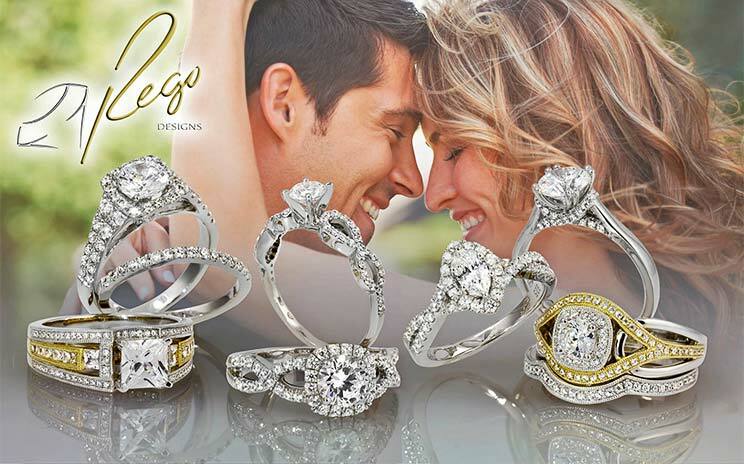 Rego Designs has it all and you can get it here at Daniel's Jewelers. We offer traditional and contemporary Bridal Sets, Engagement Solitaires, and something called Millenium Vintage.